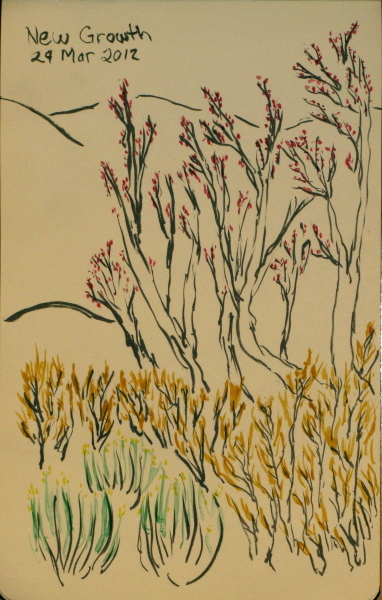 My "in situ" sketches for the month of March. Waiting to get my car unlocked to get at the keys, should have just gone hiking. 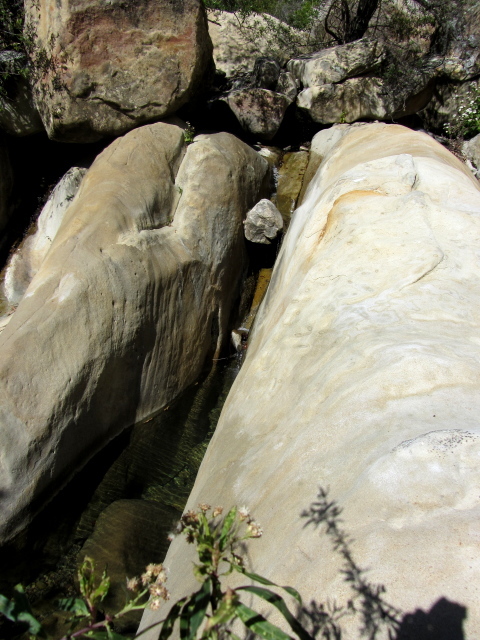 Rocks and plants along Mission Creek. The falls on the creek. 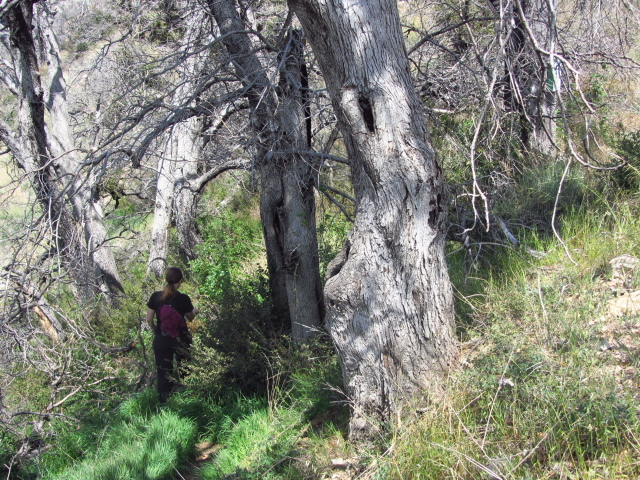 A bit of tree making its living on the wall in Millard Canyon. 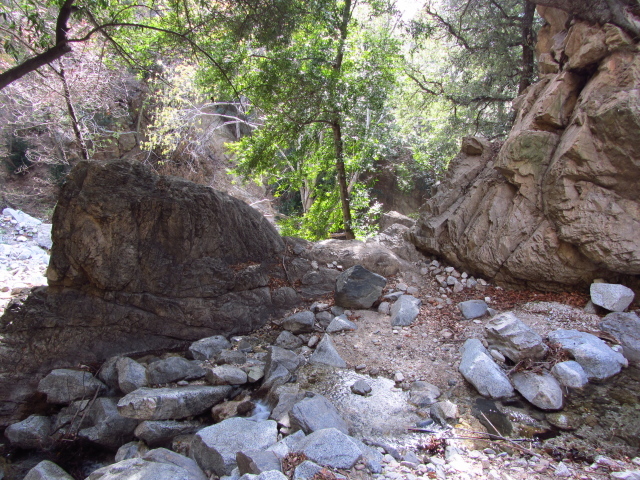 I started out in Lion Canyon and took the Rose-Lion Connector Trail to make my way to Rose Valley Falls. Except for scrambling up to the east fork falls, the route was all quite gentle until the connector, which presented a bit of a climb. The route follows a dry stream bed on the way up with sections of smooth eroded areas where I just guessed I go up where there is no vegetation, eventually seeing boot prints again as the soil changed. A bit of lovely but narrow trail tread on the Rose-Lion Connector Trail as it climbs westward. Below, a few puddles remain from flowing water. Reaching the saddle at the top, there is just a tiny bit more climb and then the trail drops down into a spring fed valley with a bit of water flowing down it. I would guess it has a waterfall too, but it would be difficult to get to that and be too much to go with my other goals of the day. Continuing down, there was a spot where, coming the other way, it would have seemed that the trail forked with two perfectly good possible routes although only the route up was actually trail. I found it odd that sometimes this trail was hard to read like that with a few surfaces that didn't take footprints or the evidence of many feet well. Crossing the creek from Rose Valley Falls just above Upper Rose Lake, I found myself at the road beside the campground sign. Dropping down again along the Rose-Lion Connector Trail and taking a peek up the spring fed valley it drops into. 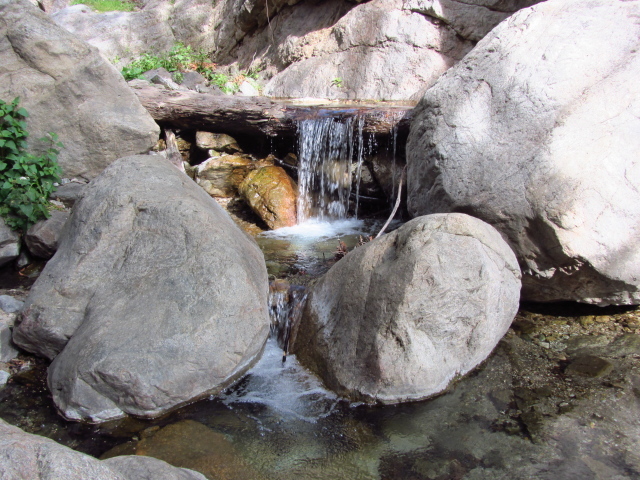 I decided to go out and see the waterfalls shown on the map behind each camp on the east and west fork of Lion Canyon and while I was there, visit Rose Valley Falls, too. I hadn't quite decided to make it all one hike in a big loop by the time I had started. I did know the loop without the extra treks out to the various falls has been reported to be about 5 miles and since the extra wasn't all that much, I felt I could do it. 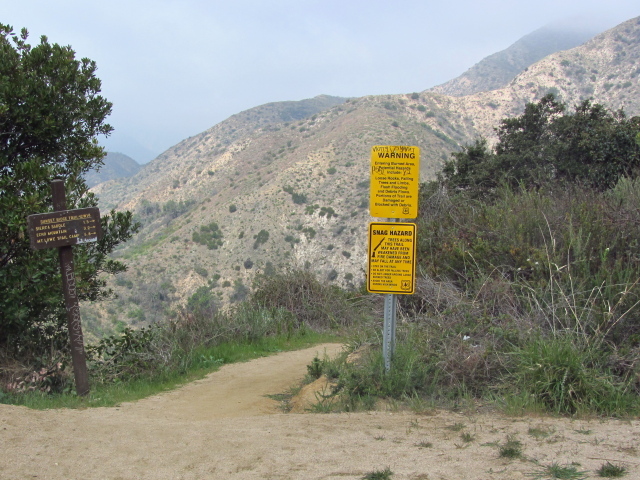 And, sure, it is a much shorter single hike if parking at Rose Valley Campground and just using the connector, but I had decided I wanted to hike the lower canyon as well as the connector. Really, the only question was loop or out and back. Doing the loop, it would have made sense to park somewhere up the road like at the information sign, but I drove down to Middle Lion and started off from there. Starting off with a creek crossing that took advantage of the waterproof boots on a row of placed stones that were largely underwater. The swift water tried to push in, but didn't make it. The campground was full as I started and one person had actually camped a little down the trail away from the campground. 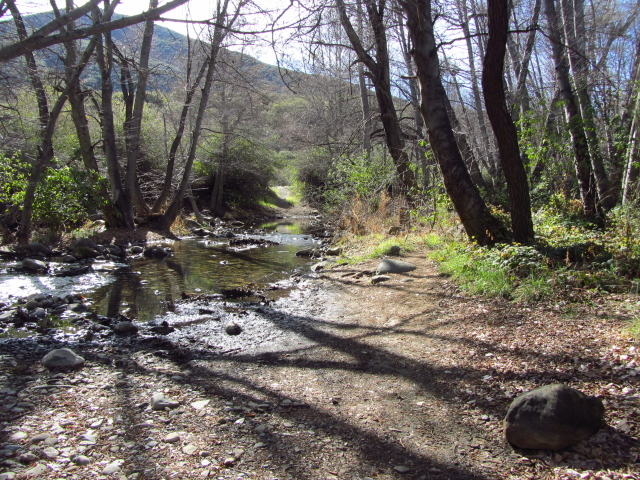 The trail dumped into the creek and came out the other side but there were no rocks for crossing. Upstream a little, there were stones placed for stepping, but many of them were underwater. I took it anyway, and the swift flow threatened to wash up and into my shoes but my socks stayed dry. Trail 22W06 (Lion Canyon Trail) with 2.5 miles to either Fork Lion Camp and 6 miles up to road 5N08, which follows the ridge back down to Rose Valley Campground. I tried to get Abbie out of the lab for at least part of the weekend with a short hike overnight, but didn't manage it. 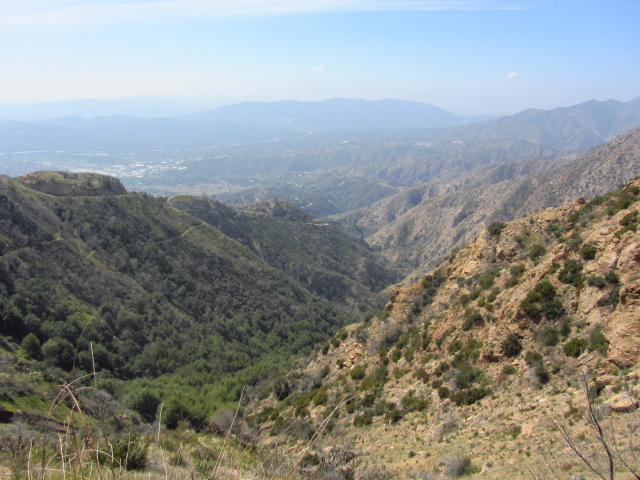 I did manage to get her out for long enough to hike around the local area and it turns out there's a popular hike that we had both missed so far in our time in Pasadena. We set about finding our way to Dawn Mine from Sunset Ridge. We found our way down Cheney Trail and parked off the road not too far from the locked gate on the fire road that marks the start. We signed in at the register and tried to make sense of the tagged map beside it. At the register, trails head down to Millard Canyon (nice trail, about a mile there), out to the front of the hills, and continues along the ridge, soon coming to one more trail. We continued just a little up the ridge and turned down this trail. 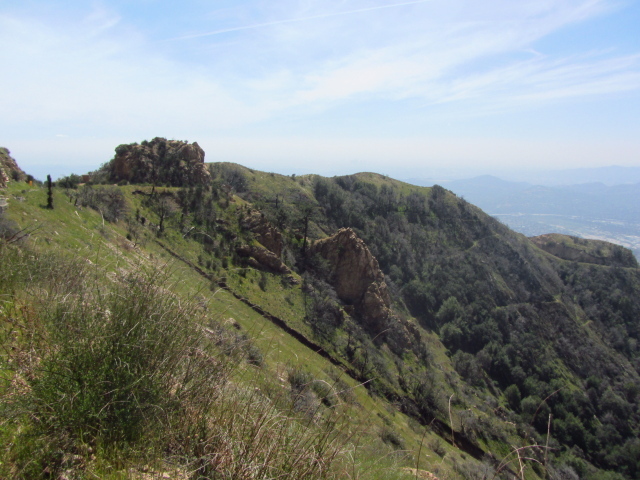 Sunset Ridge Trail (12W18) splits off from the paved fire road and makes for a much nicer hike. 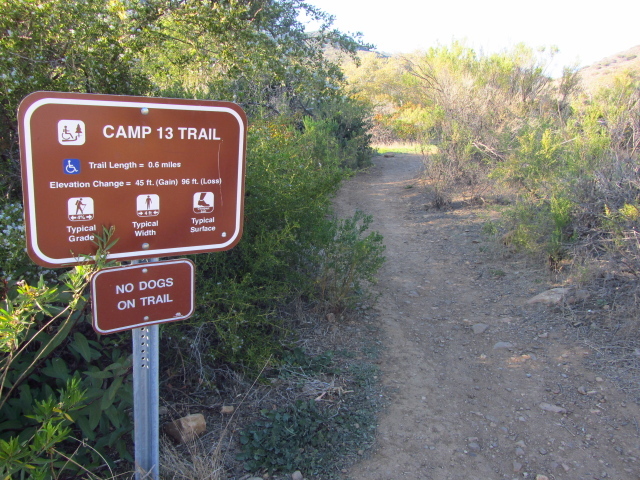 For now, it also comes with scary warning signs, but the trail is looking good right now. Destinations: Sierra Saddle 1.5, Echo Mountain 3.2, Mt. Lowe Trail Camp 5.8 miles, all up. As we went, the sun came out. Rain was promised for the Sunday, but this Saturday was beautiful. From our vantage point on the trail high up the canyon, we spotted Millard Falls, still closed to any access due to the fire, and never quite completely on display between rocks and trees. 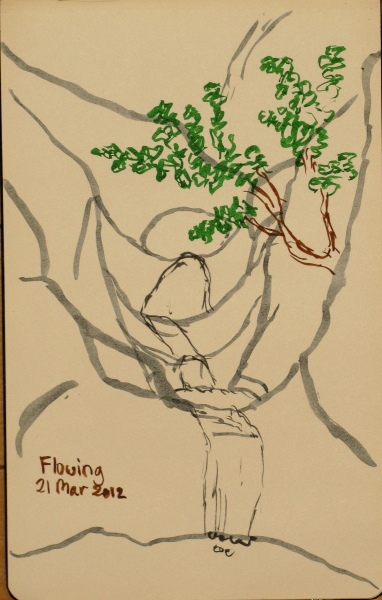 Further along, we spotted the falls up the Saucer Branch. 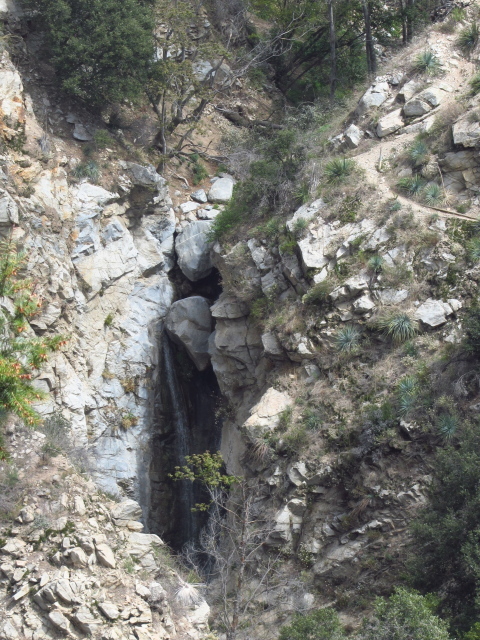 Millard Canyon Falls actually has a couple of rocks trapped in the top of it. It's hard to see all of the falls without actually going down into the canyon, and there was plenty of water coming over it to make it worth looking at. 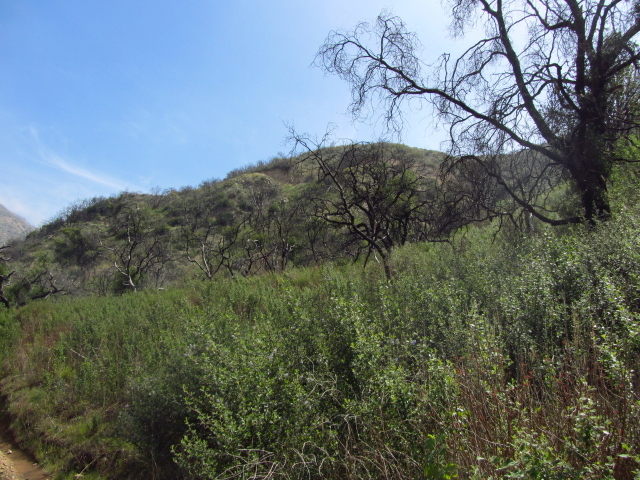 This area was burned by the Station Fire, but it's got a strong greenness to it now. 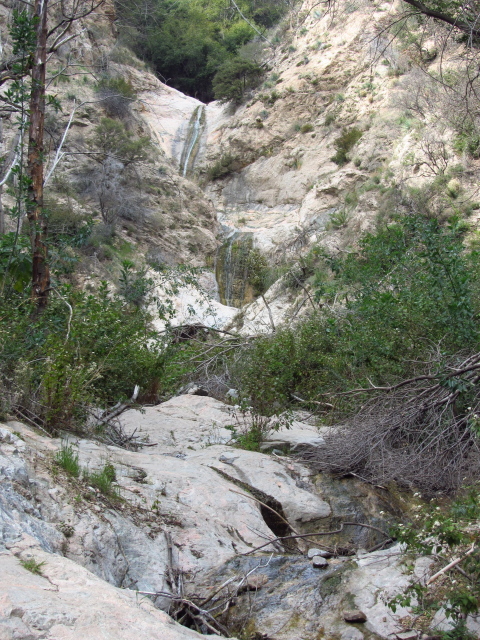 Saucer Branch, a tributary canyon feeding Millard Canyon that has a large waterfall on it. We came to a fork in the trail by a cabin. The trail past the cabin seemed rather well used for if it was for the cabin only. We went up again, continuing on Sunset Ridge passing a sign claiming it was closed. This doesn't seem likely based on the closure map and there wasn't a matching sign anywhere for people coming the other way. We found all kinds of mountain bikes coming down the trail at us as we climbed. A few of the switchbacks had developed trenches down the middle from mountain bike braking. That was the worst the trail got as it was a very good trail. 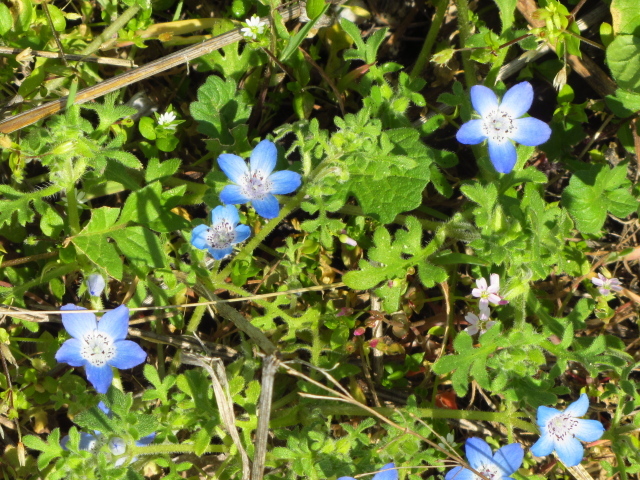 Delicate flowers popping up because it is spring. Baby Blue Eyes. 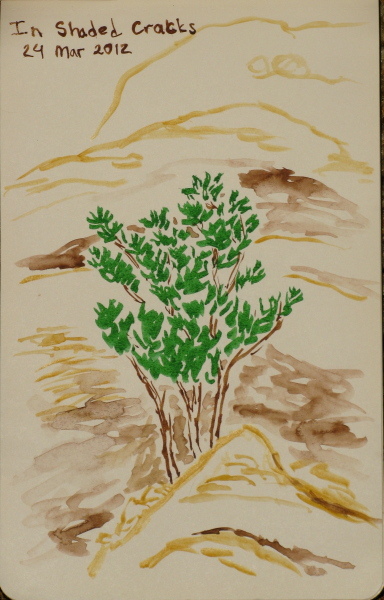 False Lupine up on the ridge growing on tall stalks over the bushes. Reaching the road again, we sat down for a bit of lunch with a pretty good view of the canyon below. There we could have also chosen a view of the crowds on Echo Mountain. As it was, we had a serenade of people shouting though the echo phone on the far side of the shoulder. 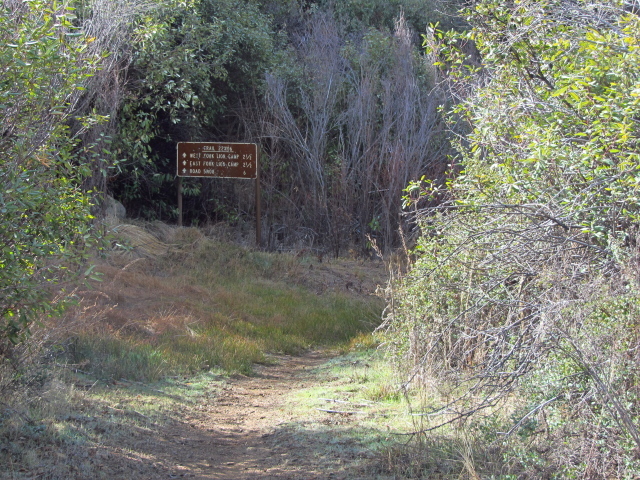 The road is still paved when the trail rejoins it, but quickly becomes dirt with the trail to Echo Mountain. Looking down the trail, we could see a long line of folks laden for an overnight at Mt. Lowe Campground, most likely, making their way along it. The road has a few rocks on it now, but nothing big enough to fill much more than half the road. Looking down Millard Canyon edged by Sunset Ridge with both a fire road and, lower, the trail. Looking back down the road to some rocks called the Cape of Good Hope, which seems an odd thing to call it. Up on the left of the road, there was another information sign. This one said this was Dawn Station and showed a picture of the old station, a rather small and simple thing that was mostly roof. 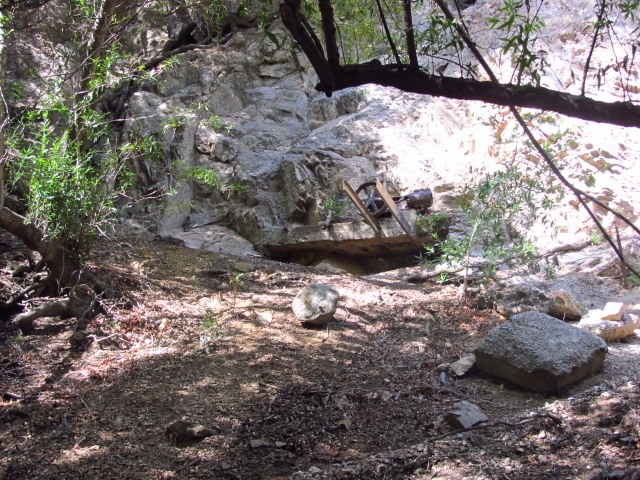 Standing next to the sign and the old foundation of the station, we could see a narrow trail heading down back into the canyon. In a position set back from the junction and closer to the road seeming to indicate that was the route to the mine was a sign saying "Dawn Mine 1 mi". We decided it meant the trail down after all, since otherwise the station was put in the wrong place. The foundation for Dawn Station. It didn't look as old as that to us. We start down the narrow trail to the Mine. The sign is almost visible behind the branches, a tall, narrow, green thing nailed to the tree. 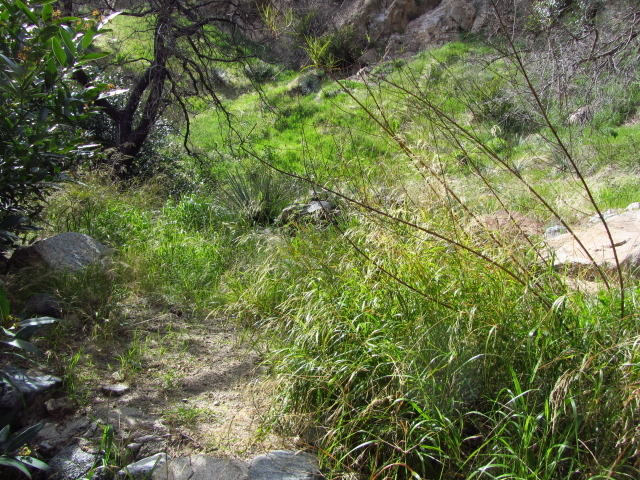 The trail stayed narrow all the way down, but was decidedly not well maintained. We found another big rock on it, but with a narrow trail, it covered over the whole trail and any reasonable route around the rock. We managed to clamber carefully over the thing. 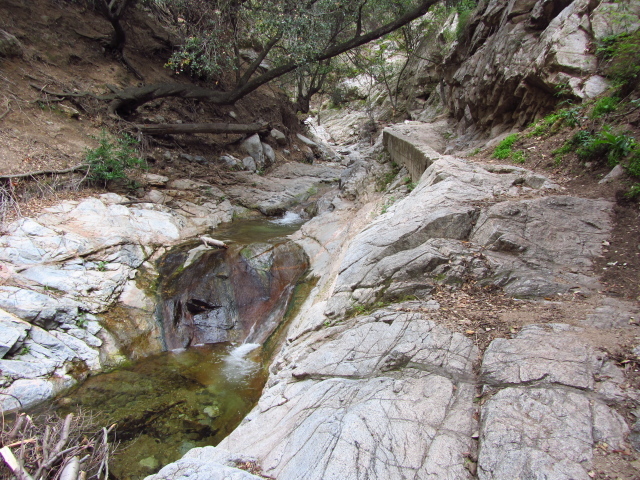 Then was the washout, with a bit of new trail forming from use down below the old one. 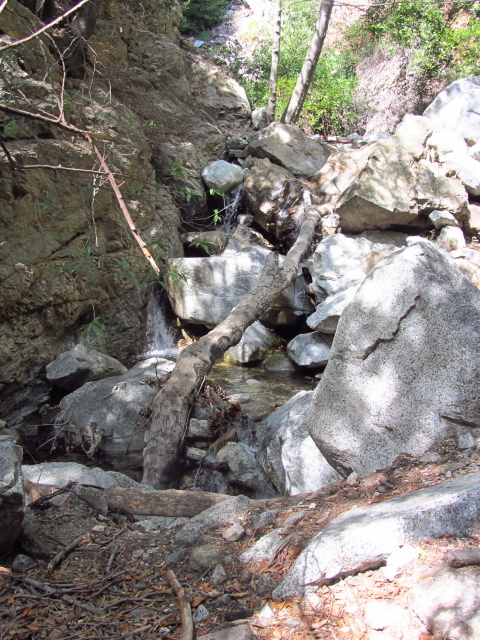 Then the bigger washout, this one with some water flowing, with even less trail along it for a longer section. Then there was a bit that just got narrower than I was really happy with as it sloped heavily to the outside covered in loose rock. 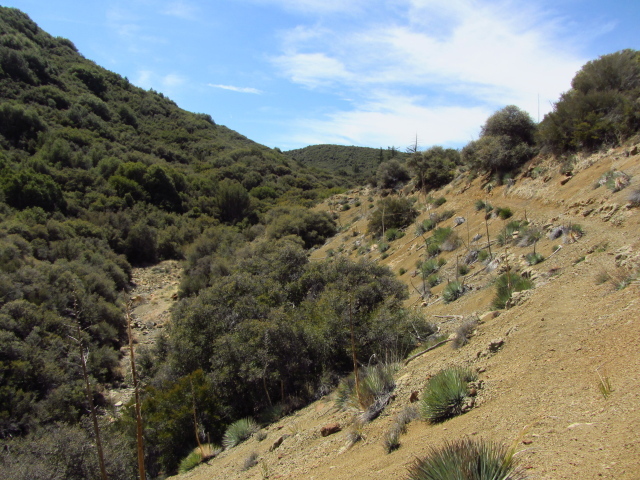 Then the trail just began splitting crazily as it got very close to the mine. We managed to come out right at the mine. The narrow, steep trail down the side of the canyon which is mostly good except where it's very bad. This one's looking very good in dark green instead of the usual grey. Reaching the bottom of the trail and the stream. The map actually shows the trail continuing up until eventually meeting with Bear Canyon. 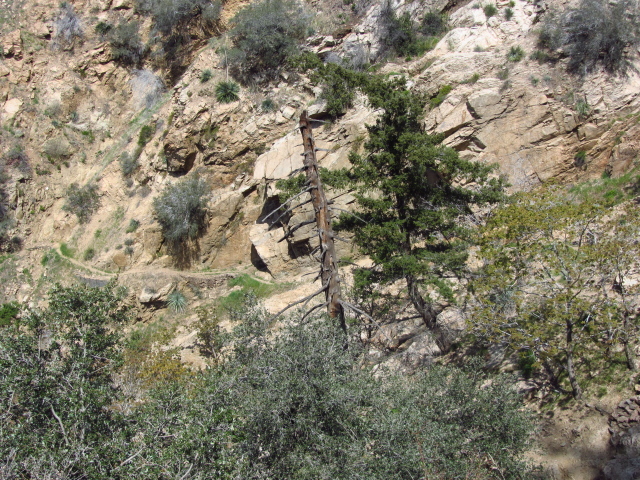 Some old machinery and cement, the part of the mine that is visible when coming down the trail or up the canyon. There is a mine shaft a short way to the left of the machinery. It had a rock in front of it, but remains open. We didn't explore inside. The timbers shoring it up have rotted significantly and there is a stream running from it and there is said to be a water filled shaft about 40 feet in. Above it, there was a rope, which apparently marks another shaft up the cliff side. We were almost hit by rocks from people making their way around up there and left it alone. 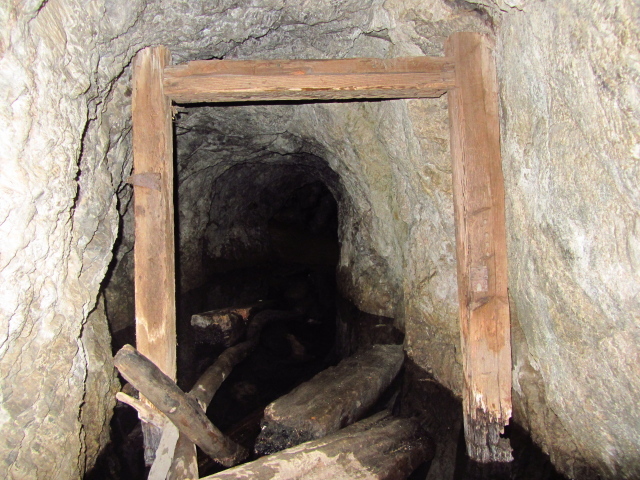 Looking into the mine shaft. Most of what has fallen seems to be the timbers rather than the rocks. The floor is covered in water. We turned down the canyon and found some flat rocks for a little rest. Abbie seemed ready for a nap, so I pulled out the sketch book and attacked putting a bay that was up on the cliff into it. Both activities seemed to take about the same amount of time. It wasn't all that long, but about three groups passed us going up while we rested. When we'd come down the trail, there was a large group trying to figure out where it went up and took our route as a clue. We saw quite a number of people in certain places on the trail. Continuing down, we kept trying to find a bit of trail and when we did, not having much of it. Black arrows mark a number of routes for the way up, but none give any hints for going down. We found a couple old cabin foundations as we went. 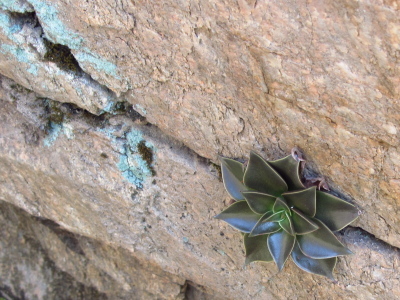 The water kept dropping underground and then sprouted out again like nothing had happened. 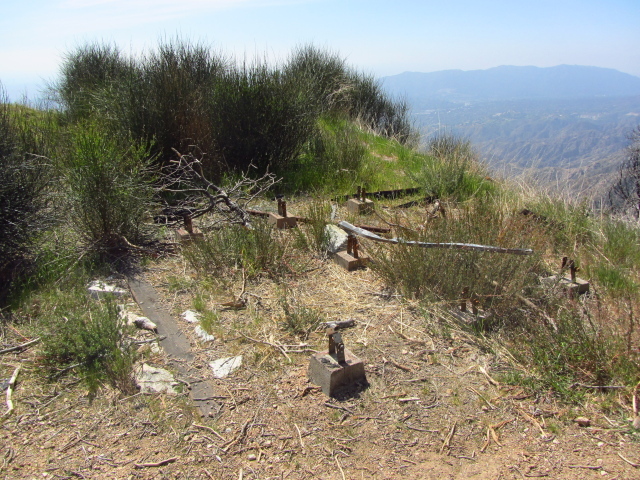 There were old bits of metal here and there, too, including what looked like a generator and an old rail from the railroad far above. The canyon takes a sudden and tight corner as we make our way down it. 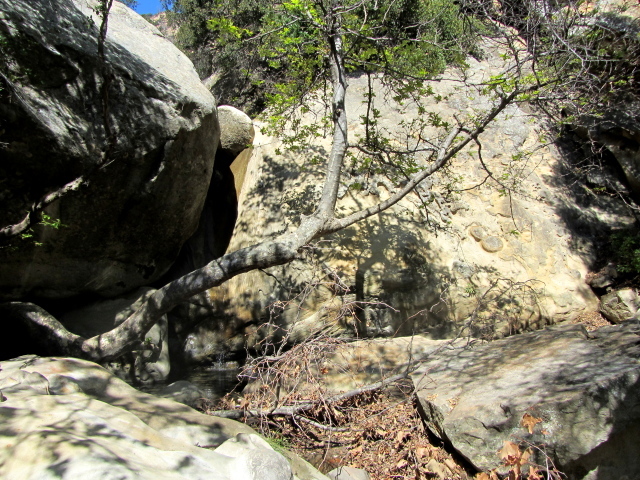 Cemented rocks in the foreground and a small square of cemented rocks in the middle show where there was once a cabin. 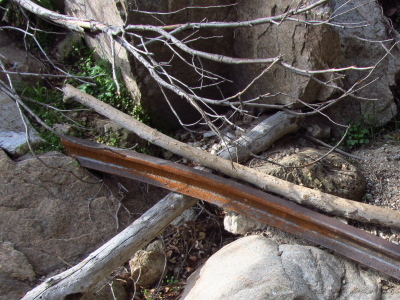 A narrow rail with a slight curve from the railroad that once passed far above. Water oozing out from all sides instead of tumbling over as it reemerges. A jacuzzi for the tired feet and legs. Rocks trying to hold back the hillside mark another cabin. Some of their garden also remained in the form of ivy and honeysuckle and irrigation pipes. 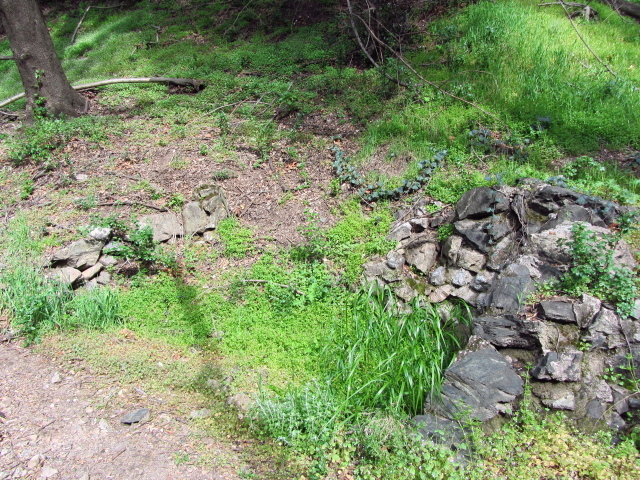 This concrete wall may have been trail improvements or simply something supporting the old pipes going down the canyon. Back to Saucer Branch going along the canyon bottom. A trail leads into it but quickly dissipates. Spotting a box on the south side of the canyon and a bit of trail heading up below it, we climbed up onto good trail once again and found ourselves below the cabin that had had trail leading to it from Sunset Ridge. We walked past the cabin and onto the trail. 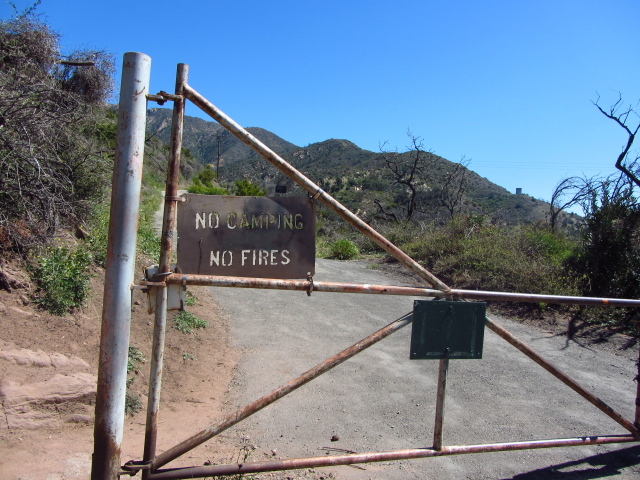 Below, numerous signs made it clear that the lower canyon is still closed and we are not to go have a good look at Millard falls. 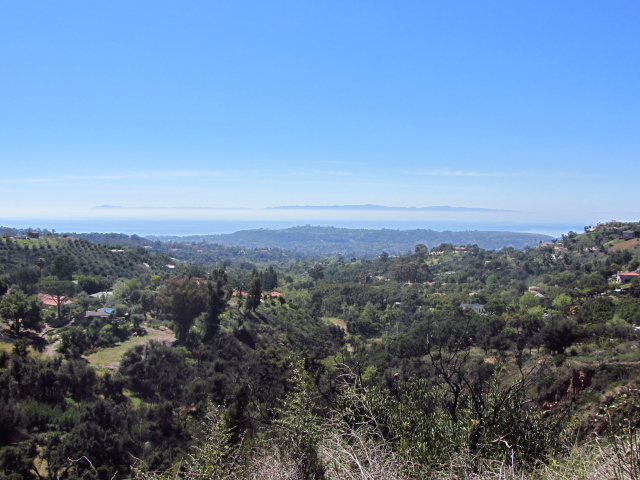 We walked back down Sunset Ridge, taking one more peak at the falls, and back to the car. I came down near another waterfall. 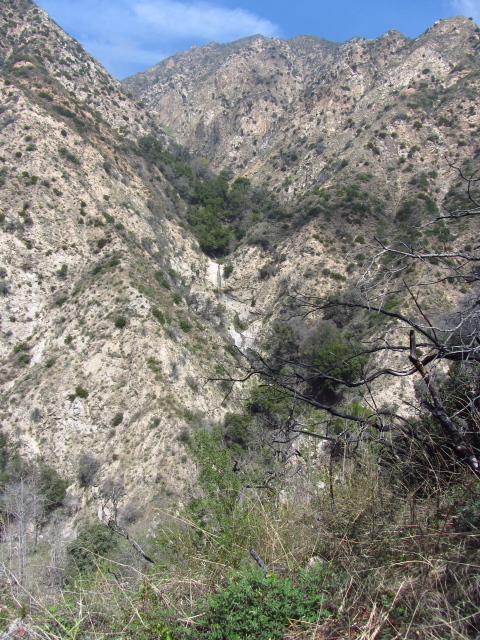 I went back down the creek to see the top of the Seven Falls. 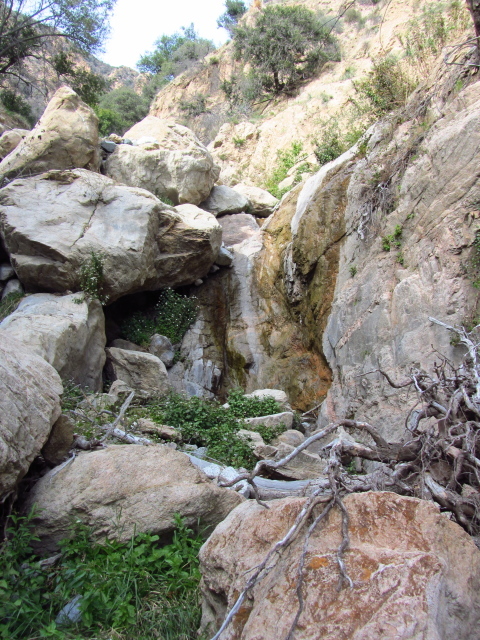 This waterfall proved difficult to pass on the way up and worse on the way down. Tall narrow cuts can result when the water follows the layers. The past weekend's rains may or may not promise a bit of water flowing over the local waterfalls. 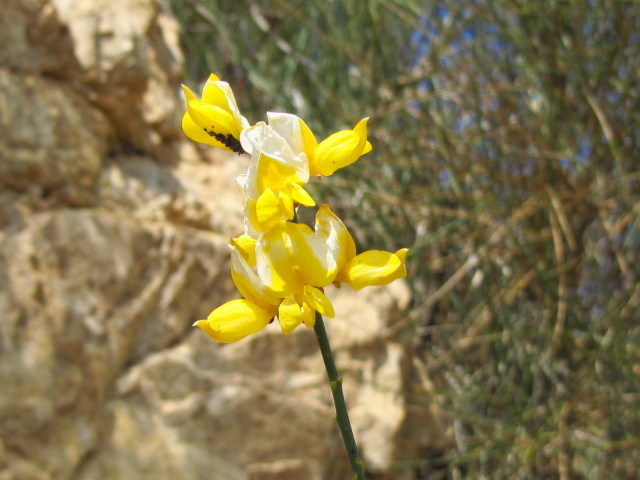 There were a couple soaking rains at the beginning of the season, but the middle of the rainy season has seen nothing significant. I was in need of a hike, having not done anything for too many days, so I decided to go up to Seven Falls, a popular destination not too all that far up. While I was looking for a short hike, I decided to leave options open for more hiking after the falls by printing out a bit of map before going. 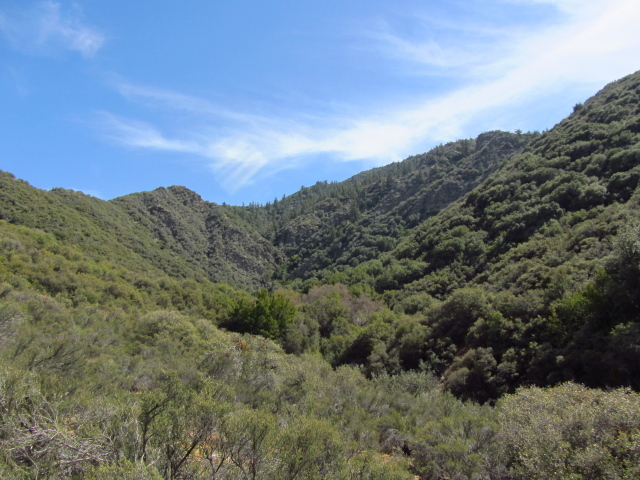 Some folks hike all the way up to Tunnel Trail along the creek bed, some go up Cathedral Peak, just a short way away, and some head up Jesusita, and those are just the more obvious options. I got near the end of Tunnel Road and parked in a large lot-like area rather than playing with parallel parking. There were some particularly bad parallel parkers up along the street begging for tickets in what is fabled to be a well ticketed area. 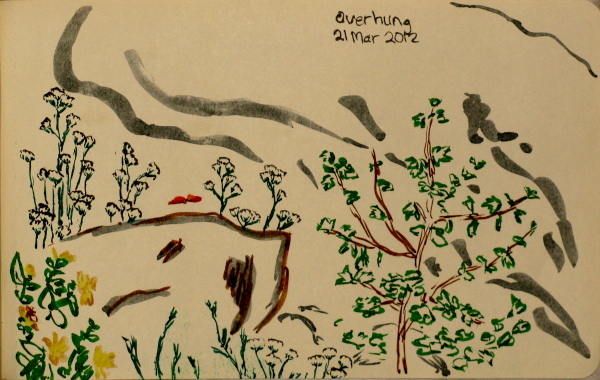 I had to walk a little bit further, but the point is exercise, (and seeing new things). This time, the sign at the end of the road pointing to Seven Falls makes a little more sense. The end of the road, for the car driving public. Many choices for where to hike from here. Today, it's a chain of waterfalls. There's a little fog out around the island today. I headed down to celebrate Holi on the beach and while I was along PCH with a few more hours of daylight, I might stop by one of the many state parks in the area and see what it had to offer. 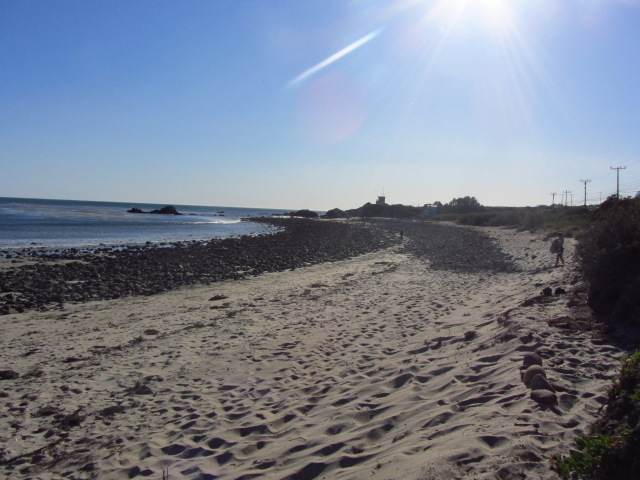 I decided to stop at Leo Carrillo, named for the actor who played the Cisco Kid's sidekick (that's what the brochure says), at the very western edge of Malibu and Los Angeles County. It didn't look promising because there's a sign by a trail near the entrance that says it's only 0.6 miles long and otherwise very easy. That doesn't seem like a hike to me. The ranger at the entrance station said there were actually trails from that one that were quite a bit longer going to a pond high above. Parking is $12 in the state park lot or free along the side of the highway, but only legal on the ocean side. A sign indicating that beyond is a walk so easy you won't notice you went on it, but not mentioning that a few feet beyond it there's more trails with more interesting destinations and routes. I changed out of my rather colorful jeans into my hiking pants and took off for the trail. Then decided I really should put my hair up since it's a little warm and wasn't the GPS in that little pack still? So I promptly noticed that I'd left my keys in my other pants also. I foolishly set to fixing it and thus lost an hour of valuable daylight while waiting for AAA. 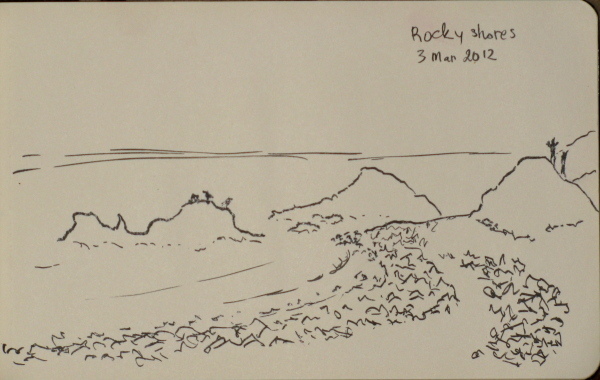 I did get to go down and see a little of the beach and draw (with something not too sensitive to wind as it was blowing very well) and watch the kite boarders making impressive wakes (did I mention there was a bit of wind?) After getting back into my car, I took off for the trail again with my hair off my neck, but no GPS. I noticed quickly but decided that's just the way it would be today. The camera kept okay track of the route through generally southward facing hillsides. Here it is mostly rocks with a few tide pools full of snails. Beyond the rocks with the lifeguard house, it has coves and caves.